Concentric Stacked Knob Set, with Set Screws, Black. Top Knob - Inside diameter .192", 3/4&q..
Concentric Stacked Knob Set, with Set Screws, Chrome. 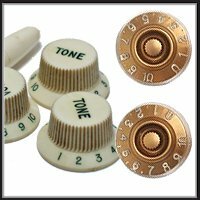 Top Knob - Inside diameter .192", 3/4&..
Concentric Stacked Knob Set, with Set Screws, Gold. Top Knob - Inside diameter .192", 3/4&qu..